CNN’s Brian Stelter spoke to Mark Cuban, owner of the Dallas Mavericks, about being one of the victims of the Sony hack and what the situation means for the future of communications. The full interview aired on CNN’s Reliable Sources Sunday, December 21 at 11am ET. STELTER: Welcome back to RELIABLE SOURCES. I’m Brian Stelter. Also in that boat right alongside George Clooney and Alex Trebek is one of America’s most successful and outspoken businessmen, billionaire Mark Cuban. He owns the Dallas Mavericks. He stars on the hit ABC reality show “Shark Tank.” He operates a cable channel and he’s an investor in dozens of businesses. Sony is the studio that produces “Shark Tank.” And it turns out that Cuban was — well, let’s just say he was not very happy with Sony’s salary offer of about $30,000 per episode for the next few seasons. Well, Cuban hasn’t really talked about the hacking or those negotiations with Sony. So when he was in New York this week, I got ahold of him and asked about that, as well as the future of private communications more generally and the possibility of disappearing text messaging apps. In true Mark Cuban style, he had a lot to say. STELTER: Mark, thanks for being here. MARK CUBAN, OWNER, DALLAS MAVERICKS: Thanks for having me. STELTER: Tell me about when you realized that you were along all of these hacked e-mails inside Sony Pictures. CUBAN: I read it online somewhere. I forget where I saw it, but I was curious about the Sony hack as well. And then I was like, oh, wait, that’s me. Right? And then I got an e-mail from somebody who said that they had gone through all the hacked things that had been released and that they saw e-mails and other stuff, other information there. I was like, OK, cool, you know, and then I just read more, as everybody else did. STELTER: So, were you embarrassed? CUBAN: No, no. I didn’t care. It’s nothing I wouldn’t have said publicly. If they want me to be there to continue to do good television, right, and make investments that I like to do, but that I otherwise would not have otherwise done or would not have been accessible to me, then it’s a decision they have to make. And if, you know, we don’t come to a resolution, I will leave the show. STELTER: To me, it was one of, I guess, hundreds of examples in recent weeks of seeing how Hollywood really works behind the scenes, and seeing that there’s a lot of personal disputes. CUBAN: Yes, I wouldn’t take it so much that it’s how Hollywood works. I would take it to, here is the type of personal dynamics between people in Hollywood and how e-mail has become the new face-to-face or had become the new face-to-face. You know, whereas before you might go to the Beverly Hills Hotel and have lunch and hash all this out, now everybody is so busy, whatever you might have said over lunch, they’re popping in an e-mail, including talking trash. It’s like being on a basketball court, the way people talk trash in their e-mails. STELTER: I noticed you said past tense, though. That’s the way it had been communicating. CUBAN: Yes, because everybody will think, look, that’s not going to happen to me. It happens. Right. It can’t — that’s just the way people think. And now that the hack has gotten so much notoriety and it’s had such an impact, you know, that’s a chip for any hacker. That’s a trophy hack, and people — hackers are going to want more trophy hacks just to put the trophy on their mantle. STELTER: It seems like this hack might have been a good thing for you, because you’re using it as a chance to promote your app Cyber Dust. STELTER: You say you’re in touch with Sony via this app now. STELTER: So, you’re really negotiating them via an app. 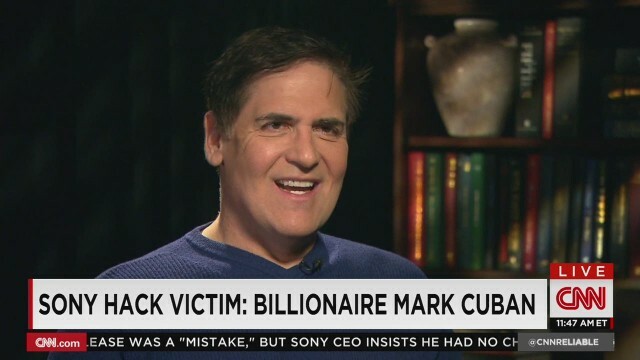 CUBAN: Sony — well, actually, Mark Burnett’s people do most of the negotiations, right? And so but we also have to incorporate Sony into it. What went from C.C.ing and Steve and Holly Jacobs and all the whole Sony crew has turned into, OK, I’m only doing it on Cyber Dust. But I started this before the hack, before there was any awareness of the hack. It wasn’t something in response to the hack. It something that I had already pushed them to do in the first place, knowing that, look, when you hit send on a tweet, a Facebook post, a text, or an e-mail, the minute you hit send, you lose ownership of it. Whoever you send it to now controls that message. They can do whatever they want. They can put it anywhere they want in any context and you have no idea. But you don’t lose responsibility for that. STELTER: How do you feel as someone that works with Sony to see them crippled by this attack? CUBAN: I feel bad for the people. Yes, for me, I feel horrible for the people. You know, the way the media is kind of — you talk about me spinning it to my advantage, right? I mean, the media, here we are talking about it. It’s turned into a big story. And there’s a lot of collateral damage. All the people whose personal information who just happened to work at Sony, they went to work for a big company, maybe they wanted the security. They’re not running a studio. They’re not movie stars. STELTER: Yes, not the millionaires. CUBAN: Right. Yes. It’s just people who are going to work. CUBAN: Now they have to worry about identity theft. Now they have to worry about the threats, the risk. STELTER: They signed up for not the hacking, but for public spotlight. CUBAN: Right. It comes with it, right? My e-mail being there, stuff happens, right? But on the flip side, you know, Sammy or Susie or Joey or whoever that works at Sony and may be a receptionist, may be a delivery person, may be somebody who just happened to get an e-mail from one of these people whose e-mails have been made public, all of their information is now searchable for the most part if you know where to look. STELTER: So, the question becomes should Sony have green-lit and made this movie that involved this plotline involving Kim Jong-un? CUBAN: Yes. Yes. Absolutely. You can’t be afraid like that, but, you know, we learn over time, right? I don’t think there’s ever been a movie made in the history of moviemaking where somebody side, well, we might get hacked by a sovereign government. STELTER: This is a new one. CUBAN: This is a new one, right? And so you learn. And had it not happened to them, it would have been something else. STELTER: But you’re on the side of free expression here. CUBAN: You have to be, right? You have to be, but now you just increase the moat that you try to build around it to protect yourself. There’s always risk involved with filmmaking, and there’s good and bad to it. But, yes, you can’t — we will learn going forward. STELTER: Mark, thanks for being here. Great talking to you. CUBAN: Thanks. Appreciate it. Yes, any time.